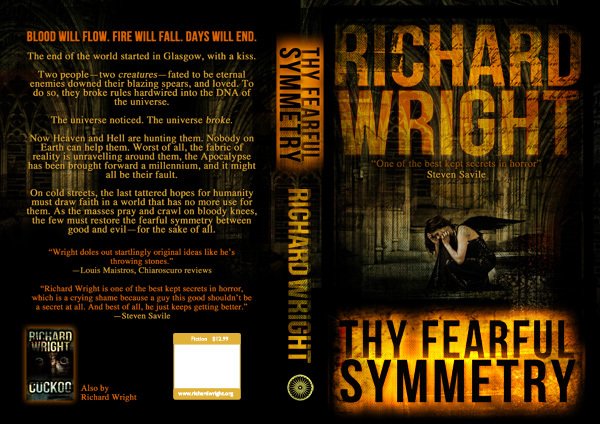 The more observant among you may have noticed the lack of a Thy Fearful Symmetry post over the weekend. You may have assumed that was because I’m insanely busy trying to catch up with things. It wasn’t (though I am). It was because I was waiting for this. Emma Barnes at Snowangels has rocked my novel, with this gorgeous cover. There are many, many things I love about it, as an image, and as a layout. Sneaking the quote from Steven Savile onto the cover (thanks Steve!) is a particularly neat and unasked for touch. I love working with brilliant people. It makes life so much easier. The above is the full cover flat for the paperback, of course – I thought I’d show you this version here, as many of you will probably only see the front when you buy the ebook. Which is what I’ll be posting about, next time I write about this TFS. Although it wasn’t my original plan, there’s a new release schedule – I’ll walk you through the whys and wherefores at a later date. Paperback – November. As I’m travelling across the world to Anthocon in November, I might as well save the paperback and do a proper launch there, at which point you’ll also be able to order it online. Other ebook formats – shortly after the paperback. It’s been an interesting journey so far – and to be honest, launch day in each format is really only halfway through the story. While I’m here – if you’re a book reviewer, and a Kindle version of the book would appeal to you, please drop me a line via the Contact link at the top of the page. Some of you I’ll come to anyway, but no harm reminding me.